New for June 2017: we have posted a video where Richard Dickinson talks about the accomplishments of friend and colleague Bill Brown in the area of wireless power transfer. Scroll down to the bottom of the page to view it. The word "rectenna" is a form of portmanteau. In this case it is a cross between an antenna and a rectifier. A rectenna is not a common site, although some forms of RFID tags might be considered to be rectennas. A rectenna is used at the receiving end of wireless energy transfer. Wireless power transmission (WPT) is the terminology most often used to describe this endeavor. Nicola Tesla was the inventor of the rectenna idea, and for that any many other reasons he appears in the Microwave Hall of Fame. His vision was that RF energy fields could be made provide energy to tap into anywhere, just put up an antenna and power up whatever you like. Tesla was absolutely a genius, but there is a lot of junk science out there that has made him into comic-book superhero status. Wireless energy transfer using induction was one of his craziest ideas. 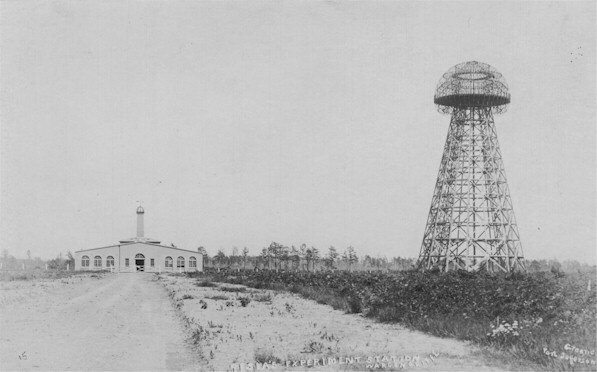 In 1898 he convinced J. P. Morgan to fund an installation on Long Island which was to provide wireless communication as well as wireless energy across the Atlantic. It was never finished, and Morgan stopped funding because he didn't like the idea of "free" energy. The 187 foot tower was removed by the U.S. government in 1917 because it was thought to serve as a landmark for German submarines. Bill Brown is regarded as the father of wireless power transmission technology. Check out this tribute to him! He also appears in our Microwave Hall of Fame. Brown used a single-polarization Gaussian beam focused on the device that power was transferred to, a much more practical approach compared to Tesla. These images came from Bill's daughter Barbara. We'll build some content around them in short order, be sure to check back soon! Check out the Bill Brown tribute video below filmed in 1999. The part about the Fisher Body Craftsmen's Guild Napoleonic coach contest is a bit of history that the average engineer should know about and appreciate. The art of model building has all but disappeared. Why build a model of a plane when you can order a complete drone on Amazon and spend less time with it than you would have in sanding the individual pieces of a work of art? 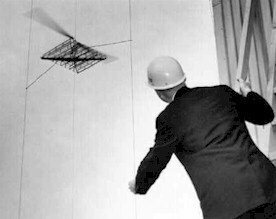 Bill's career in wireless power transfer spanned three decades, starting by lofting a helicopter powered by his personal shop power drill in 1965. When you think of wireless power transmission, remember that essentially all of the power efficiency metrics are owned by Bill Brown. Further, for the space solar power which may solve the worldwide environmental and energy issues confronting humankind, Japan has been involved in necessary research to realize space solar power with countries such as the United States through information exchange. Currently confirmation of each required principled technology has been in progress and it is important to apply step-by-step verification in the future toward the realization while ensuring its safety and economic efficiency. One of the impediments to large-scale solar energy conversion in space is man-made space junk. 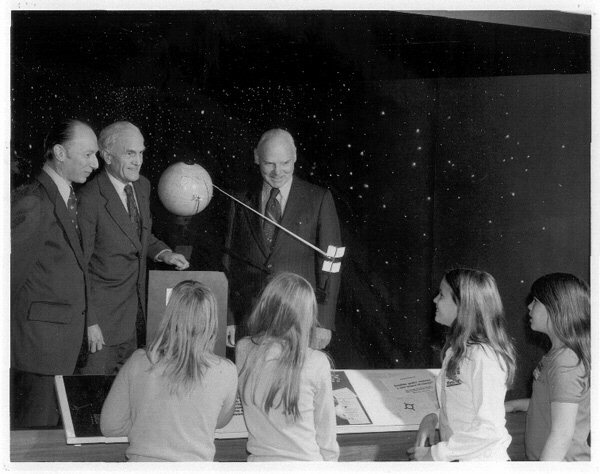 Read more about space power on Wikipedia.